Yankee Supply is your one-stop supplier for all material handling equipment needs. 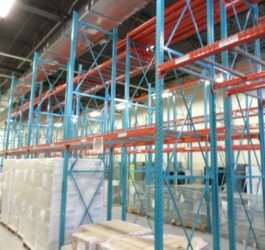 Whether you’re looking to buy pallet racking or a customized rolled-steel mezzanine, we have the knowledge and equipment to get the job done. We’re an industry leader in efficient material handling solutions for a variety of commercial and industrial businesses. We’ve built our company over the past 35 years with our customers in mind, and we bring that expertise to every job. Our inventory is easily searchable so that anyone can find the right equipment for the right job. In addition to our new equipment, we maintain a ready stock of quality used items. If we don’t have an item in our inventory, our talented team of machinists can fabricate anything our customers need. We have over 20 years of experience crafting many types of customized items for our diverse list of customers. We can make custom machine bases or platforms, stretch mezzanines across hard to reach places, or tool machinery parts. Whatever the task, we have the solution. We believe in providing the best customer service possible, and that’s why we offer complete installation services for our products. We have expert installation crews located throughout the United States standing by to assemble racks, mezzanines, and more with speed and precision. If you’re looking for material handling equipment that lasts, at a price that won’t break the bank – call Yankee Supply today.